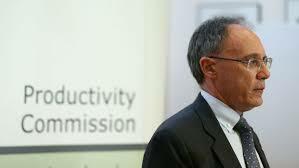 Productivity Commission Chair Peter Harris has called for the dismantling of current industrial relations infrastructure in order to further intensify the exploitation of Australian workers. Harris expressed dissatisfaction with what he claimed were “low expectations” of a Workplace Relations Report the Commission produced last year. He called for “breaking the Fair Work Commission (FWC) up into two bodies”, one to take over the awards modernisation process, and the other to take over the setting of the Minimum Wage. He said the new bodies should abolish decisions by precedent where “it is always the prior view that must be dislodged, rather than a fresh view taken of the matter.” He added that the new bodies should have their own “independent research capacity” and not be reliant on “expert” opinion commissioned by parties appearing before the commissions. Thus the new bodies would be freed to more aggressively pursue workplace “reforms” deemed by the bodies to be in the “national interest”. Harris has form in changes to the institutions of workplace relations. He supported the Accord (it broke “decision-making structures into economically manageable outcomes”) and was senior private secretary, from 1989 to 1991, to Prime Minister Bob Hawke who, together with his successor Keating, was a pioneer of neo-liberal policies embracing deregulation of the economy. All workers know or sense that “lifting productivity” under capitalism means attacks on their wages and conditions. And “national income” is a different animal altogether from what a family has to live on. What Harris left out of his rosy view of the past was the decline in unit labour costs. These were revealed in a graph that he supplied. Unit labour costs (ULC) measure the average cost of labour per unit of output and are calculated as the ratio of total labour costs to real output. The average cost of labour is calculated on the basis of factors such as wages and salaries, paid leave, superannuation, taxes on employment, training and recruitment costs, and fringe benefits (included in wages and salaries in the national accounts). Average labour costs divided by average labour productivity constitute unit labour costs. A decline in an economy’s unit labour costs, as is clearly the case in Harris’s graph below, represents a decreased reward for labour’s contribution to output. To put it in simple maths, if average labour costs are set at a value of 2, and average labour productivity increases over time from 6 to 8, then unit labour costs decline from 2÷6=1/3 to 2÷8=1/4. The outcome is worse for workers if average labour costs decline during that increase of average labour productivity. If average labour costs halve (an extreme example, but it keeps the maths simple), then the equation becomes 1÷8=1/8. The graph shows a decline in the workers’ share of their own increased productivity. Capitalism continually seeks just such a decline. 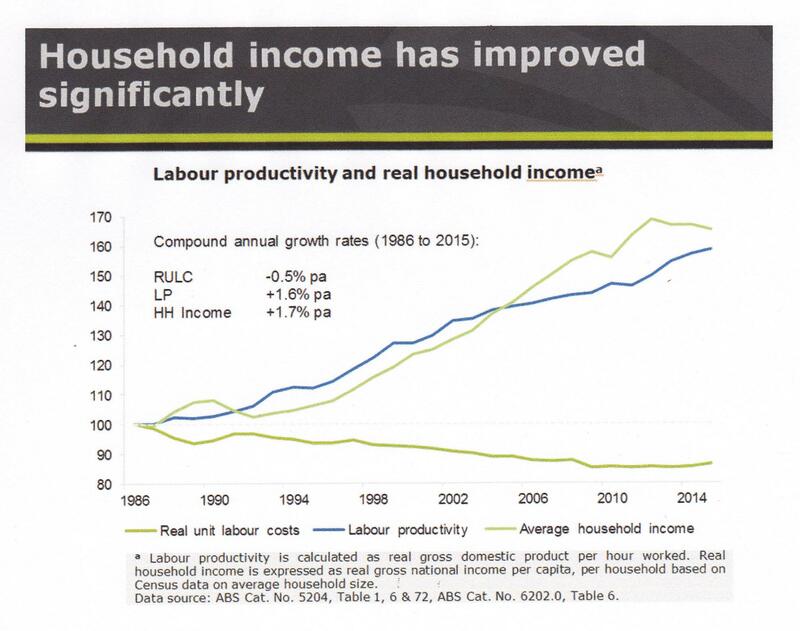 The blue line showing rising labour productivity is fairly obvious, but what about average household income? How can workers’ wages increase while their share of their increased productivity declines? Average household income or “languishing incomes for the poorest”? Average household income is a misleading statistic used to paint a rosy picture of life under capitalism. As the footnote to the graph says, it is a measure of gross national income per capita expressed in terms of the average number of people above 15 years of age per household. Gross national income (GNI) is basically gross domestic product (GDP) plus any income from overseas sources. GNI is therefore better if there is a healthy Terms of Trade and worse if there is a deficit. Terms of Trade is directly affected by payments made by multinational companies to their headquarters overseas, so in Australia, with so many US, British and other multinationals dominating our economy, there is always a trend towards a negative Terms of Trade where money paid out as profits exceeds any money coming in. Australia’s terms of trade have declined over the last decade, resulting in the slight downward curve at the end of the average household income line above. To have had such a marked overall increase in average household income at a time when wages have been held down in both the government and private sectors simply means that there has been a massive increase in wealth enjoyed by the rich and super-rich, that their share of our labour productivity has gone through the roof. For the unemployed, the precariously employed and those on low wages, trying to cope with today’s cost of living is nearly impossible on the “languishing incomes for the poorest households”, the existence of which is denied by Harris. When Marx wrote prior to the age of monopoly capitalism, that is, prior to the era of imperialism, that capitalism sought to degrade workers to “one level mass of broken wretches past salvation", he was describing a tendency arising from the drive for capital accumulation. That drive has been resisted by organised labour and in developed capitalist countries workers have fought for and won a social and cultural expectation of a minimum standard of living. The setting of a minimum wage is an expression of this. If one combines the agenda of the Productivity Commission for a “fresh approach” to the minimum wage and to awards with the present Government’s attacks on unions through the Registered Organisations legislation and the revived ABCC then we see capitalism forcing the issue of just what it can get away with in degrading the working class in the direction of one level mass of broken wretches. The best elements of our comrades in trade unions and within the precariously employed workforce must dig in for the long fight and be prepared for the sacrifices inevitable in class struggle.